(2)Letter opener with otter foot handle. (4)Chairman's gavel. 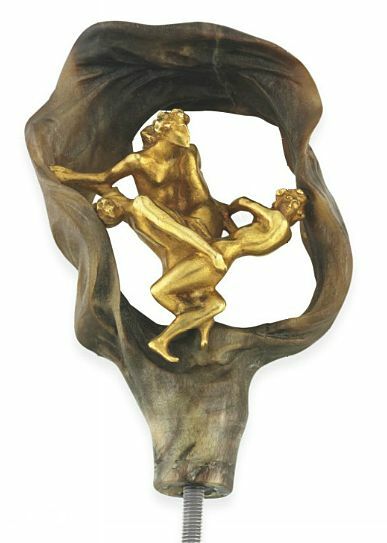 Alternatively Auctioneer's gavel. (6)Shark's tooth made in lady's pendant brooch. 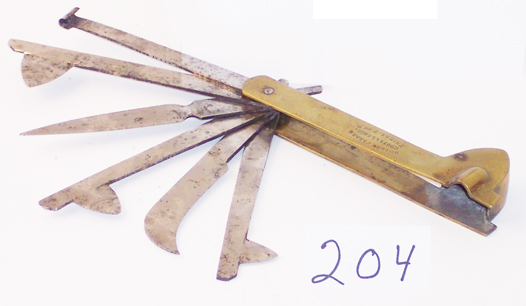 (7)Four bladed fleam, brass and steel. Doctor's/vet's tool for blood letting. Early 19th century. (8)Late 19th century nut crackers. (9)Stole. Probably part of a Masonic regalia. (10)Early light blubs = don't know. (12)Walrus ivory chess man (pawn), of the Lewis type, 13th/14th century. 1. It's posh and it's a handle, Mike. 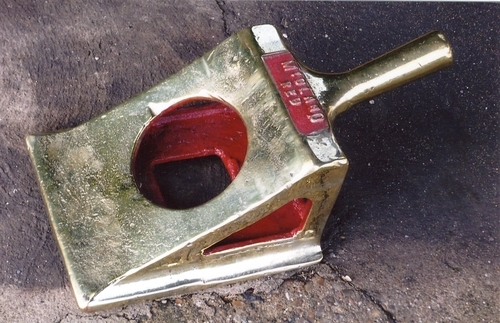 René La Lique Horn and Gold umbrella handle. 3. Spot on, Mike. The acetylene (C2H2) being generated in the lower chamber containing calcium carbide (CaC2) by water (H2O) dripping on it from the upper reservoir. 4. Think bigger Mike, it's a ceremonial mason's mallet for dignitaries to tap foundation stones with and pretend they've laid them. 9. A shorter version of the liturgical stole, Mike. 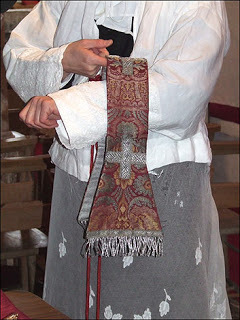 It's a maniple worn by priests on the left wrist ~ originating in the pagan hand-fasting ceremony but pinched by the church as a good idea to demonstrate the bond between husband and wife & Christ and his church. 10. Good guess, you're right. 12. Early ivory chess-piece thought to be a ward (equivalent to the modern ‘rook’ or castle) ~ but there is some suggestion that this may be a pawn. The Persian word for "chariot" is "Rokh" and that changed to Rook in modern Chess. The piece, shaped like a chariot in India & Persia is now almost universally represented as a crenellated turret. For this, the Italian word rocca, meaning fortress, could be responsible. The term for Pawn is suspected to have originated from the Old French word paon, or from the Spanish peon "day labourer," “peasant” or "pedestrian," from Medieval Latin pedonem "foot soldier". I'm surprised Mike didn't get No 11. It's obviously an old wooden balloon mould, almost certainly French. You'll have to make these a bit harder Mr C! I do apologise for the simplicity of these objects, Rog, but I don't like to make it too hard for the wider audience. (Don't ask 'what wider audience?') You're absolutely right, it is a board of French balloon moulds for manually dipping in latex and leaving to cure. Note the smaller bulge for the rolled mouth-piece. No 5 looks like a solid brass wheel chock, probably for a bus. 5. is a brass Midland red bus wheel-chock, I've found a better picture of a slightly later version in its original livery (see 5b). The buses had deep cherry-red coach-work and a jet-black roof ~ very handsome indeed.